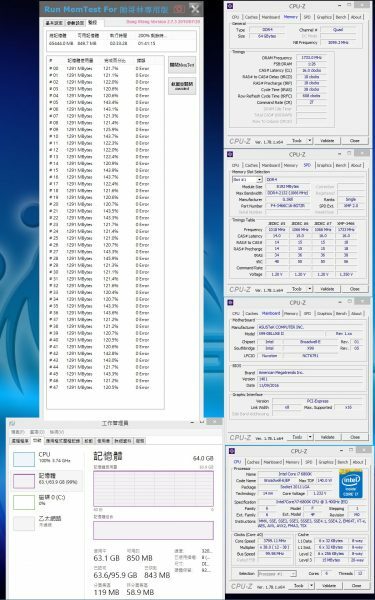 Since the widely-acclaimed launch of Trident Z RGB memory series in December 2016, G.SKILL focused heavily on bringing high performance DDR4 16GB RGB modules to the Intel X99 platform. 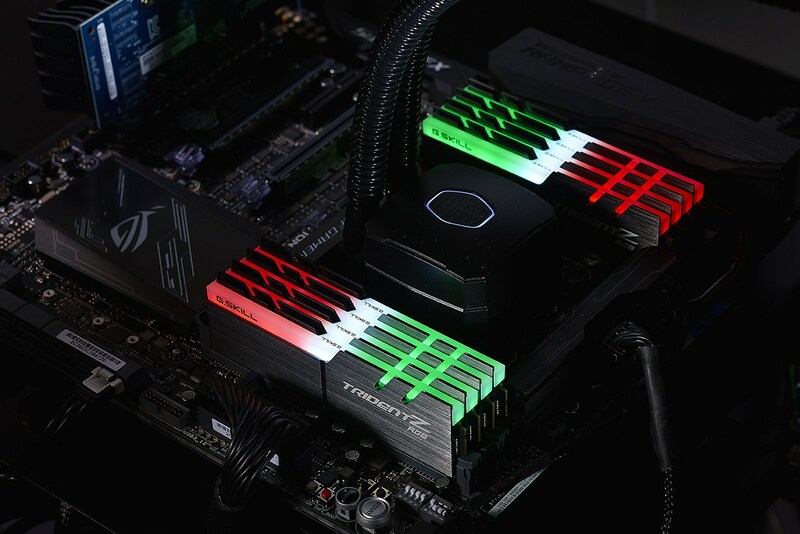 Now, the Trident Z RGB is available in full sets of 8 modules for a total of 64GB (8GBx8) or 128GB (16GBx8) capacity, along with lighting control software support for the Intel X99 platform from most major motherboard vendors. To commemorate the addition of X99 support, a new Trident Z RGB trailer is available to show the vivid full-range RGB lighting effect. In the never-ending pursuit of performance, G.SKILL is proud to announce RGB memory kits sustaining memory frequencies up to a blistering DDR4-3466MHz CL16-18-18-38 in 8GBx8 and DDR4-3333MHz CL16-18-18-38 in 16GBx8 configurations, which are perfect for any high performance workstation or gaming PCs. 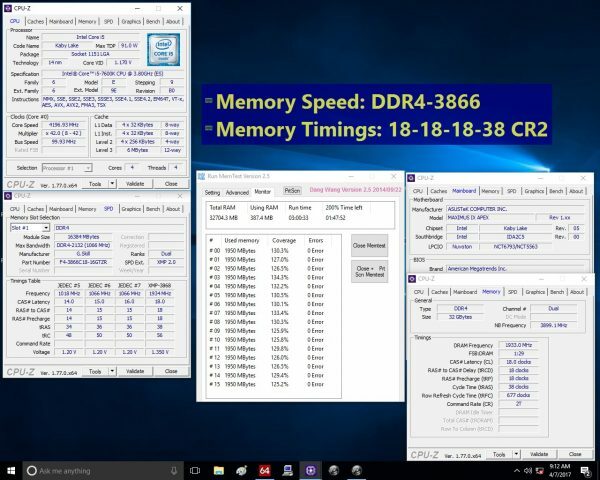 The following validation screenshot shows the DDR4-3466MHz CL16-18-18-38 64GB (8GBx8) memory kit stress testing on the ASUS X99-Deluxe II motherboard with an Intel™ Core® i7-6800K processor. As software programs and users demand more speed and responsiveness from computer systems, the need for higher capacity memory kits is growing dramatically in the PC community. The DDR4-3866MHz 32GB (16GBx2) kit provides an ultimate combination of capacity and speed, which makes Trident Z RGB the ideal choice for building an extreme performance PC in full RGB display. The following validation screen is the DDR4-3866MHz CL18-18-18-38 32GB (16GBx2) Trident Z RGB memory kit on the Intel Z270 chipset-based ASUS ROG Maximus IX Apex motherboard with an Intel™ Core® i5-7600K processor. 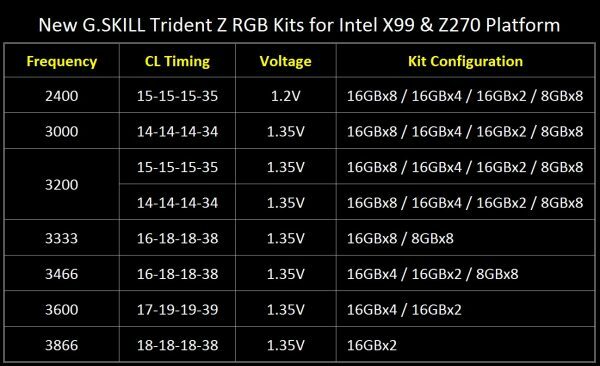 The following chart lists the specifications of the new additions to the Trident Z RGB series. These new Trident Z RGB memory kits are scheduled to be released in May 2017, with XMP 2.0 support for a trouble-free overclocking setup and are backed by G.SKILL’s limited lifetime warranty.